Shopify is one of the most trending E-Commerce platform that helps you to Sell online, on Facebook, or in person. You can even customize the e-commerce software as per your business needs with ease. Run your business wherever you are by having a good grip over the software with these tutorials. Knowledge to build out you own e-commerce business. 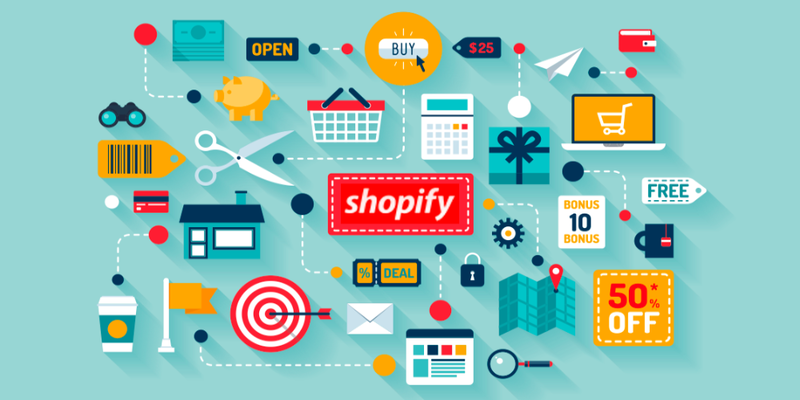 As part of the course you will build and host a website using Shopify. Without additional skills in design or programming you will learn how to manage & control your own store with confidence! In this course, you will learn how to create categories and menu at Shopify store, how to add and edit products through Shopify store, how to choose a great looking for your store by adding themes. Also, you will learn how to customize your theme, how to set up domain name of your store, how to set up shipping and tax rates, and how to set up payments with all the payment options at Shopify. Shopify Dropshipping: Build a Shopify dropshipping store & start Dropshipping from Aliexpress. Step by step, this course will show you the core elements that are used to increase the conversion rate and how to add them to you shopify ecommerce store. Then you will see how to create urgency on your dropshipping ecommerce shopify store and on your checkout page by adding count downers, “number of items left”, social proof popups and many others elements. In addition, you will be shown how to target some of your leaving customers or your previous customers via an email marketing system. This course includes analysis, opinions, techniques, short-cuts, and tips for Shopify. It also includes step-by-step site build demonstration section and offers a unique and systematic framework for planning and launching a Shopify site. Furthermore, the topics and areas covered in this course includes introduction to e-commerce, print on demand and how it works, niche, audience and theme research and selection, and using cutting-edge tools. Shopify from A-Z: The Complete Beginners-Advanced Masterclass - Learn how to build a profitable Shopify business! This course is divided into seven parts. You will cover the basics of drop shipping, the software Oberlo from A to Z and learn how to identify products with high profit margins on Aliexpress. You will then concentrate on creating a beautiful-looking highly converting Shopify online store. You will in detail focus on Facebook traffic, engagement and messages ad campaigns and you will learn how to get cheap traffic. Further, you will cover the software tool Mailchimp and you will learn how to use Mailchimp in order to build a reliable customer base. You will then focus on colour branding and you will additionally cover how to do Instagram marketing, build product-related Facebook groups, do marketing on Pinterest. Start your profitable Shopify Store. Setup everything on your store. Instagram to bring in targeted visitors. Scale up your business and automate everything. With this course you will be able to get started with Shopify and create a store that generates you money day in and day out. In 2019, learn how to build a successful eCommerce business using Shopify, Aliexpress and Dropshipping, from scratch. Then drive them to your store to buy your products. As part of the course you will build and host a website using Shopify. You will also have the option to use host your email with TMD hosting. In this course, you will learn how to build your own E-Commerce Dropshipping Business from the ground up. The whole process is documented, from the initial idea, all the way through to the first sale through Facebook ads. This course includes articles, templates & tools that'll help to optimize your Shopify Dropshipping journey.